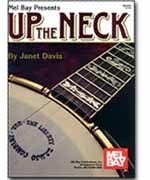 A superb instructional text for five-string banjo dealing with the 5th through the 22nd fret. Included are chapters on roll patterns, chords, songs, licks, chord progressions, arranging songs, improvising, melodic style, chromatic style, chromatic style, back-up, and much more! Also included is an abundance of great Janet Davis solo tabs. Written in tablature. The two CDs included in this package contain 144 tracks in stereo to accompany the book. Listen and play along with Janet Davis as she explains and plays each exercise.